A while back I posted a few pictures of my favorite coloring books for adults. I knew I enjoyed breaking out the crayons every once in a while, but what I didn’t know is that I’m totally trendy when I do it. A coloring book has hit the Amazon best sellers list! Johanna Basford’s book, Secret Garden: An Inky Treasure Hunt and Coloring Book, absolutely gorgeous, and I’ll probably be adding it to my collection very soon. There are a lot of articles about this new trend (like this one), but I thought I’d add my thoughts. Art is therapeutic, calming, and fun, but it’s also difficult, intimidating, and potentially crushing. 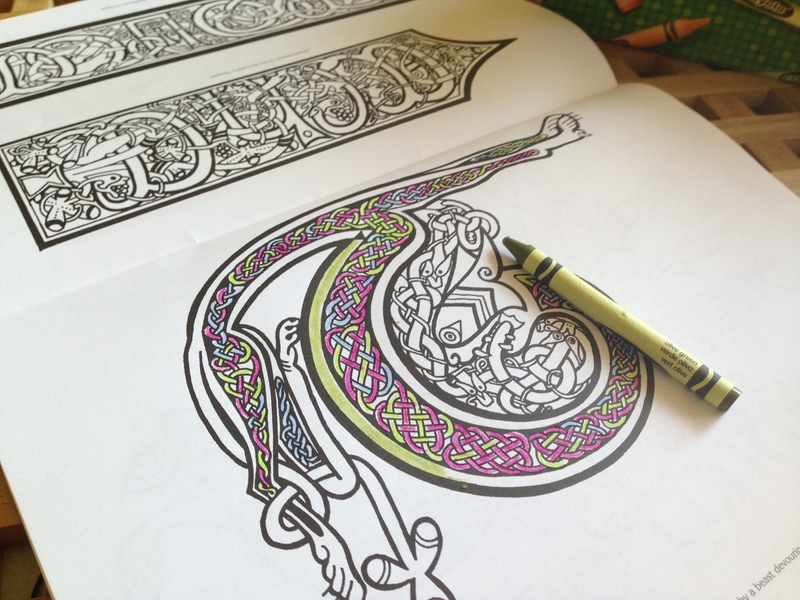 Coloring takes out the hard part and leaves you with a wonderful, gentle activity. Here are five books to inspire you to break out your crayons. It definitely is. I also like to spend the time on elaborate and repetitive doodles and then fill them in with crayons or paint, sort of DIY coloring book. It’s all the fun of art without the pressure of being creative or accurately representing an image. I highly recommend it. A friend let me borrow her Mandala coloring book when I went to visit my mother in the hospital. It really was calming, a perfect activity when you have too many concerns on your mind to concentrate on reading. And as you say, much less intimidating than doing art. I found myself going off into that childhood LaLa land. I bought a colouring book recently for my wife. She tells me that she often uses it. I really must buy one for myself as well. It really beats playing with my phone!